The Department of Radiation Oncology at the Upstate Cancer Center is the first cancer facility in upstate New York to provide patients with the latest, leading-edge technology to help cure prostate cancer. 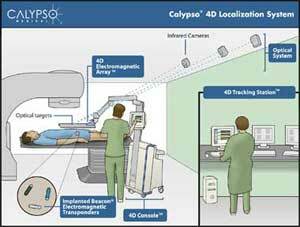 Using the Calypso® 4D Localization System™, Upstate will now offer radiation therapy delivered to the prostate with continuous, objective, organ-motion detection and monitoring. The same way that a Global Position System, or GPS, pinpoints the location of your car, the Calypso System can continuously locate the target during each radiation treatment- in effect, GPS for the Body®. 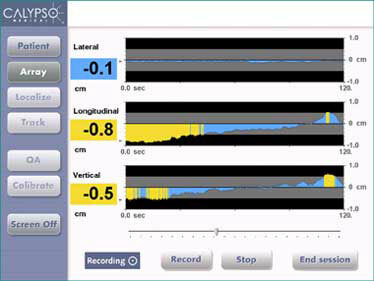 Three implanted Beacon ® electromagnetic transponders within the prostate. Radiation therapy is a noninvasive treatment designed to destroy cancer cells, but the radiation beam must reach the tumor accurately to maximize cure rates and minimize the risk of side effects. "It is very important that radiation target the tumor and avoid unnecessary radiation to healthy tissues," said Jeffrey Bogart, MD, Chairman of Radiation Oncology at the Upstate Cancer Center. "Higher doses of radiation therapy for prostate cancer improve cure rates, so accuracy in treating the prostate is essential to optimize cancer outcomes." The Calypso System shows exactly where the tumor is at all times during radiation treatment so that the doctor can make quick, important decisions about your care. The key feature of the Calypso System is its Beacon® electromagnetic transponders. Each the size of a small grain of rice, three Beacon® transponders are implanted in the patient's prostate before starting radiation therapy in a procedure similar to that of a biopsy. The transponders work with the Calypso System and the 4D Tracking Station™ and can continuously detect the slightest movement of the prostate during each radiation treatment. When Calypso detects transponder motion, or the tumor target becomes improperly aligned with the radiation beam, it sends out an alert and the radiation treatment stops until the target is back in range. "The prostate's location can vary from day to day, and it can even move during treatment," added Dr. Bogart. "We already have expertise in using intensity modulated radiation therapy, but with the Calypso System we can now prescribe radiation therapy with sub-millimeter precision. Calypso should allow us to simultaneously improve prostate cancer control and lower the risk of side effects." A display shows the position of the prostate continuously. When the prostate is out of position, the graphic is color coded to alert the therapist. This is an actual patient record that demonstrates a prostate that has drifted out of alignment by 1 cm (yellow indicates out-of-tolerance).